Strettweg is a “narrow road” near the small town of Judenburg in Styria. In the nineteenth century Judenburg was a garrison and industrial centre. A farmer named Ferdinand Pfeffer began to find old iron and bronze in one of his fields in 1851, and they were quickly excavated according to the ideas of the day. 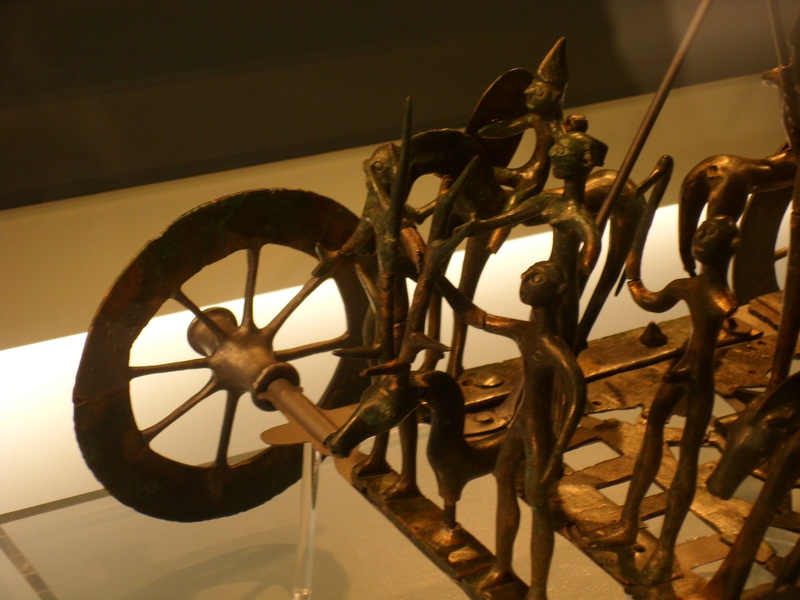 Pfeffer’s field contained other objects, but the most famous is this model of a wagon with humans, horses, and deer-like creatures standing on it. 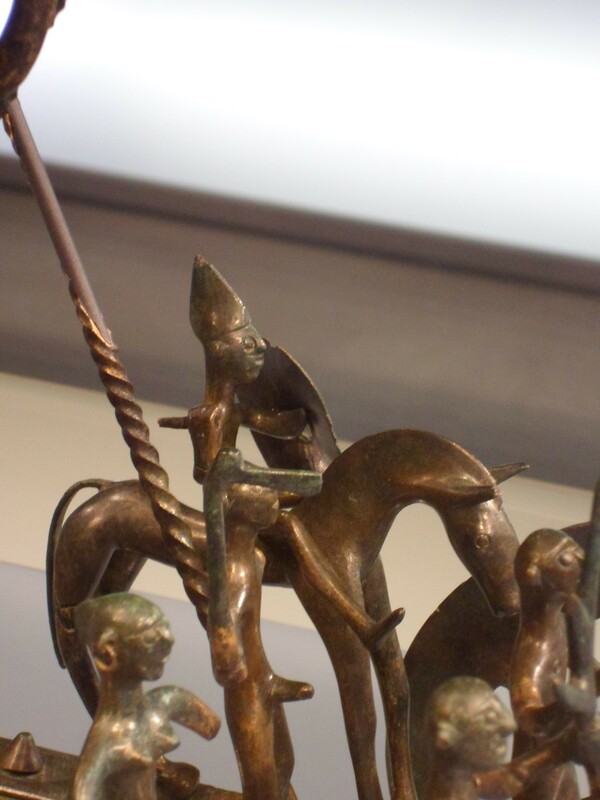 An armed rider on the “Kesselwagen.” Archaeologisches Musuem Graz, Schloss Eggenberg, no. 184. Photo by Sean Manning, September 2015. 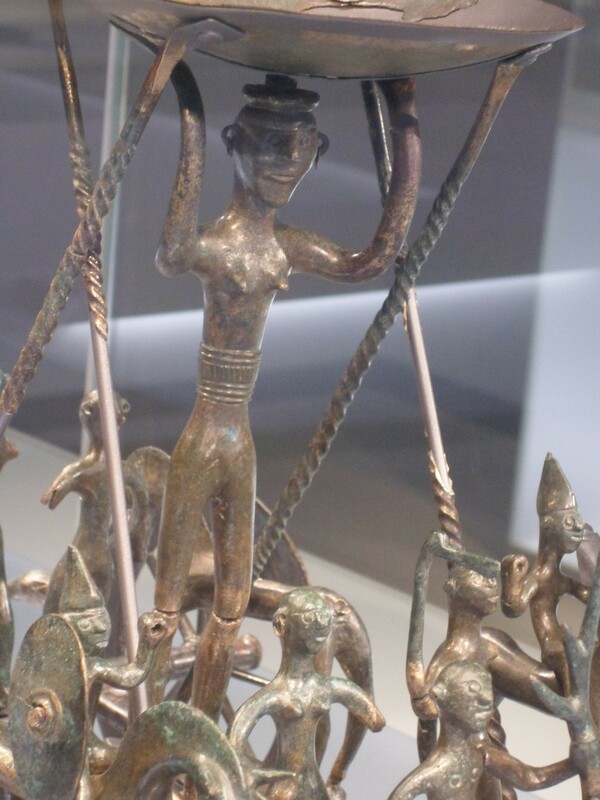 Given the theme of this blog, its appropriate that some of the figures carry axes, spears, shields, and other weapons. Another view of the rider with the shield and pointed hat. Both the men and the women beside him are getting a bit excited. Archaeologisches Musuem Graz, Schloss Eggenberg, no. 184. Photo by Sean Manning, September 2015. 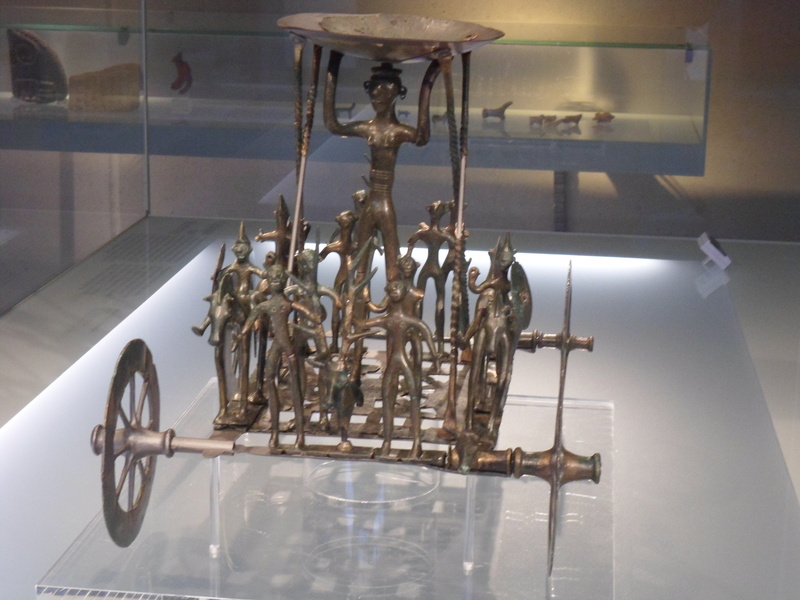 The central figure on the wagon is twice as tall as the others. She wears something round on her head, ear-rings, a wide belt around her belly, and not much else. I wonder if she was originally painted. Front view of the central female figure of the Kesselwagen. Archaeologisches Musuem Graz, Schloss Eggenberg, no. 184. Photo by Sean Manning, September 2015. I am a bit surprised by the twisted decoration of the X-frame. Twisting like that is typical for ironwork, since it is easy to heat an iron bar, grip each end in a pair of tongs, and twist to create a spiral pattern. Bronze was more often cast to shape, since it can become fragile when heated. 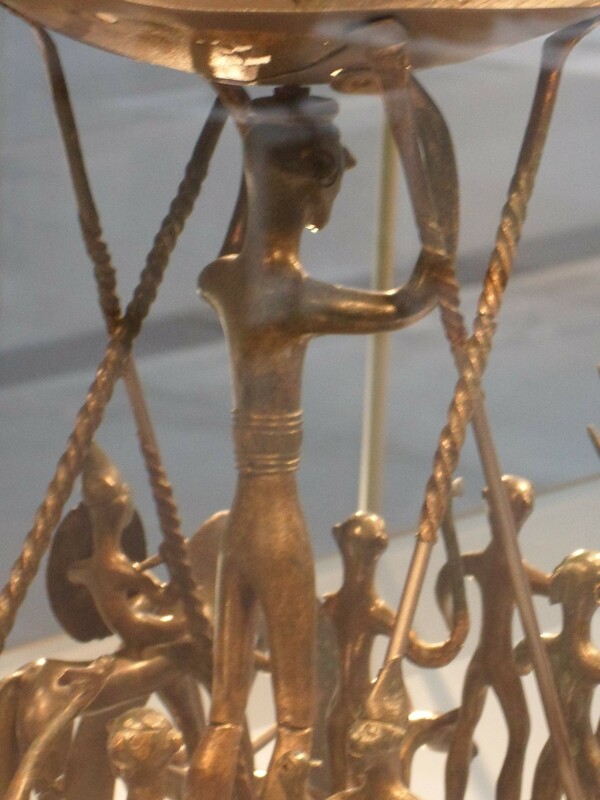 Back view of the central female figure on the Kesselwagen. Archaeologisches Musuem Graz, Schloss Eggenberg, no. 184. Photo by Sean Manning, September 2015. The figures on the base also include animals with bodies and heads like horses, but tall many-pronged horns like deer, and a smaller size than full-grown deer. Archaeologisches Musuem Graz, Schloss Eggenberg, no. 184. Photo by Sean Manning, September 2015. 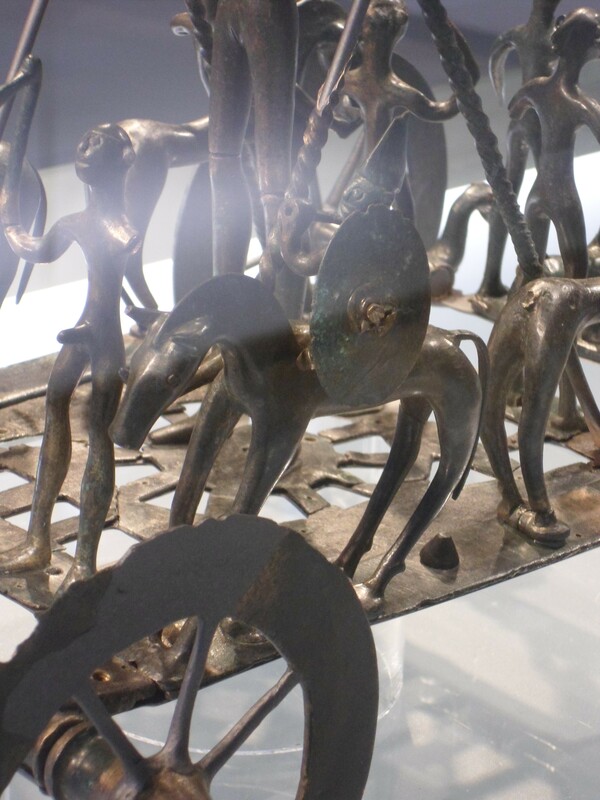 I do not know what to make of this scene, other than to say that it has something to do with religion, and the flat plate has something to do with the ceremonial consumption or pouring of alcohol. The Austrian archaeologists seem to mumble something about a sacrificial procession, although the figures are standing not walking. I suspect that people ranging from Neo-Pagans to historians of religion have written hundreds of pages on this artefact, and I don’t want to add to the clamour. So rather than ratiocinate or pontificate, I will gaze in humane bemusement upon the cult wagon of Strettweg. If any trace of the things I am passionate about survives for 2,600 years, I suppose that it will look pretty odd to the people of the future too.